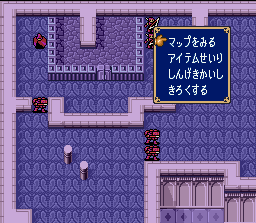 Many people refuse to play this game due to their lack of Japanese knowledge. I wrote this tutorial so you can understand the menus. With some practice, you’ll be able to remember all of them, as the Japanese symbols aren’t that difficult to remember. Inventory: Allows you to manage weapons and items. Details are explained in a section below. Here you can highlight, with the A button, the units you wish to send to the chapter. 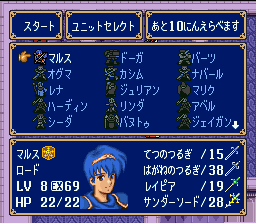 The max amount of units you can take appears in the upper right part of the screen. When you highlight a unit, that number will drop by 1. When you select the highest number of units you can take to the chapter, that number will return to the max value. 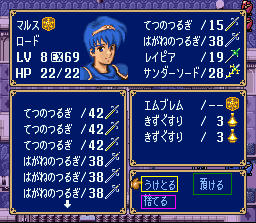 When you are finished choosing your units put the cursor in the upper left area and press A to start the chapter. Save game: Does just what it says. Suspend: Saves current data. You can resume in the main menu by choosing “Resume Chapter”. 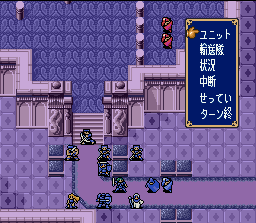 End turn: Proceeds to the enemy’s turn. Wait: The unit will stand in the space selected and his/her turn will end. Equip: Lets you select a weapon you wish to equip. Trade: Allows the selected unit to trade weapons with an adjacent unit. This option will only appear when standing next to another ally. Items: This will let you manage your items. The sub-menus are the same as the “Weapons” menu. Deposit (green box): Gives an item from to inventory to the storage. Drop (pink box): Drops an item from the storage. Again, you’ll be asked if you are sure about it. Animations: This will manage the battle animations settings. It has 3 options but you shouldn’t be messing with this. If you want animations to be shown only in the map choose the second option. 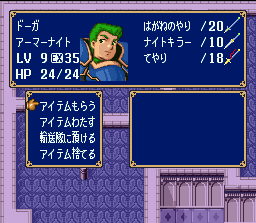 When a character can use a staff, the option will be the second in the menu. In the case of Tiki and Banutu, you can transform them with the first option if the have a dragonstone. 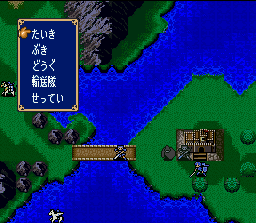 Other actions, such as visiting villages or recruiting characters will appear as the first option.